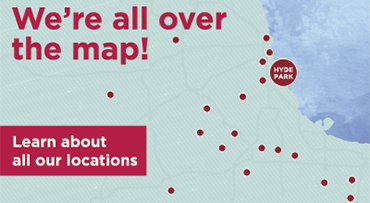 We are here to help you find the best way to navigate to the University of Chicago Medicine, which is located at 5841 S. Maryland Ave. in Chicago's historic Hyde Park neighborhood. 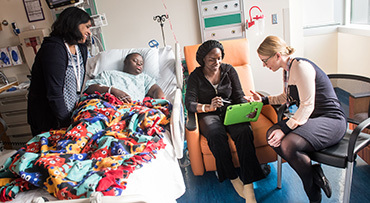 We offer step-by-step directions for those who are traveling to us from the north, south or west direction to our Center for Care and Discovery, Bernard A. Mitchell Hospital and Duchossois Center for Advanced Medicine (DCAM). You can also find directions to Comer Children's. 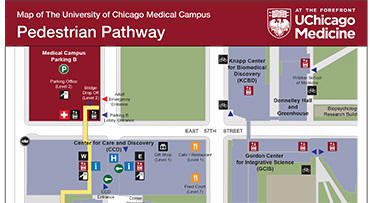 Due to ongoing construction in the area, please follow the directions provided on this website, and allow an additional 20 minutes of travel time to reach UChicago Medicine's Hyde Park campus. Follow Morgan Boulevard, turn left at 57th Street. Turn left at Cottage Grove, which is the next street. At the next block, 56th Street, turn right. The Center for Care and Discovery entry and valet is ahead on the right. Turn left onto Cottage Grove Avenue, and drive north for one block. Turn right onto 59th Street. Mitchell Hospital entry and valet is ahead to the right at the blue awning. Continue on Maryland past 58th Street. DCAM entry and valet will be on your left. Drive north on Cottage Grove for three blocks. Turn right onto 57th Street. Turn right onto Maryland Avenue. Mitchell Hospital entry and valet is ahead to the right at the green awning. Take the Bishop Ford Expressway (I-94) or I-57 northbound to the Dan Ryan Expressway (I-94) west. Stay in local lanes. Follow Morgan Boulevard to 57th Street. Turn left on 57th Street and cross Cottage Grove Avenue. The Center for Care and Discovery entrance and valet is on your right. Continue on Maryland past 58th Street, DCAM entry and valet will be on your left. Follow Stony Island Avenue north, just past 71st street, stay to your left to continue onto Stony Island Avenue. Continue to Midway Plaisance — which is just after 60th Street. Drive north on S. Cottage Grove Avenue for three blocks. Turn right on 57th Street. Take the Stevenson Expressway (I-55) east to the Dan Ryan Expressway (I-90/I-94) east.